There’s been a disturbance in the Force……. Over the last few weeks I’ve been putting the finishing touches on several small projects that have been sitting on the sidelines. I plan to have these projects up for sale by Cyber Monday. One project was started over two years ago, but I kept stalling out on it, or my time got switched to other projects. I’m finally now going to offer it up for sale. 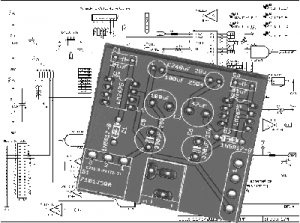 That’s the long rumored and promised XF551 Control board. This modification will allow on both my re-imaged boards and Atari’s original XF551 floppy drives to have a track display and some front panel controls. More info will be available on it’s product page. Another offering will be a simple 1200XL cartridge extension board. I’ve always been aggravated by Atari’s funnel shaped cartridge port that was too narrow to allow the Polish cases to be inserted. I finally got off my duff to do something about it. Further info is also on it’s product page. Something that came up on a AtariAge.com thread a few weeks back also sparked my creative juices. Some people were grousing about the problem of the Atari 130XE’s cartridge port being awkward to use because a person sitting in front of the computer couldn’t see the connector when he/she was inserting the cartridge. It seemed to become a feel_to_insert situation. It became a particular irritation when someone frequently changed cartridges. While it’s not a perfect solution, I decided to try a dual right angle cartridge extension board. With it you can insert two of your most commonly used cartridges and switch between them without having to physically remove the cartridges. You still will have to reboot the computer after the switch. tf_hh was invaluable in developing a functioning prototype. More info is also on it’s product page. Another thought I just had was a modified RA SDX cartridge. Essentially instead of the horizontal cartridge slot at the end of the internal pcb, put a vertical cartridge slot there. It should be doable. The tricky part’s going to be the cartridge case design. But it might help the unstable stacking effect on 1200XL/800XL/130XE computers. Since I already have functioning prototypes, hopefully I can have a preliminary rendering up by Cyber Monday as well. There’s still a few small projects on the drawing board so to speak. Hopefully while waiting for the parts and boards to come in for these projects, I can finish them as well. At this point I am only planning one big project for next year, the 1090XLR. Not sure yet just what shape it will take, but hopefully I can come up with a prototype box by mid year 2017. My printer is behaving, but the Hatchbox filament is taking a little while to dial in. It wants to ooze a little more than the XYZ filament. So I backed down the temperate from 220C to 218C. I’m printing the lid now, so we’ll see how well it does. Also setup a skirt/brim to hopefully eliminate the wad of filament that wants to collect at the nozzle. Print time is rather long for the bottom, a little over 4hrs, but I’m printing at medium speed/quality. The lid is supposed to take about 2hrs. I’ll do the bottom tomorrow morning. I don’t want to let the printer run over night. Too many times it’s run amok and after only 5 minutes of inattention I’ve found a ball of filament dancing with the extruder on the build plate. Progress on the 3d files. First preliminary fit printing went well. Found some obvious errors in dimensions. Fixed them. Now I am ready to do a secondary fit printing. But…… the original filament cartridge that came with the printer is about out. I have 3rd party filament, so the next adventure is going to be dialing the printer into the new manufacture’s filament. I am also going to be switching entirely to Simplify3D software. I’ve been using XYZ’s software, but the next batch of prints I want to attempt is going to require custom supports and that software just can’t handle it. 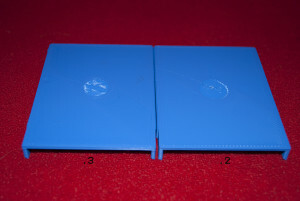 I have a new SDX cartridge case that I want to see if it will 3d print. I maybe tempting fate….. I don’t normally post off topic, but Oklahoma just suffered it’s second massive earthquake in less than six years. ……well massive by Oklahoma standards. Preliminary 5.6. I was on my workbench when a minor tremor began. I thought at first that my cat had headbutted my leg. He’s prone to do that when I’m ignoring him and I was. He weights at least 12 pounds, so yes he can make the chair shake when he does that. But the tremor continued and when I looked up he was in the doorway of the room, coming into the room, no where near my leg. Then the tremor got rougher and I began to hear things in the kitchen rattling. My magnifying lamp began to sway in time. My lcd monitor tipped forward and then back. Suddenly there was a sharp jolt, a rolling sensation and then a smaller jolt. My cat jumped, spun around and dug his claws in for a hasty retreat from the room. I knew then what it was. In the rest of the house I could hear things shifting and falling. The trailer continued to rattle and quiver for a couple of minutes longer, but the main quake was over. It’s been nearly two hours now. There seems to have been a couple of minor tremors since, but it maybe just my nerves. Reports are slowly coming in. Some damage in Pawnee, but so far no injuries. It appears that the epicenter was close to the town, just like the first one that hit very close to the city of Prague Ok in 2011. No damage at my house, my cane fell down in the living room. Mostly jangled nerves seems to be the only real damage. Let’s hope it stays that way. I’m thinking about changing my avatar. I used to think tornadoes were the norm. Now it’s getting to be earthquakes. Today I get to announce new hardware for sale. It’s literally amazing what the Atari 8bit computer was able to do some thirty years ago. And the ability of some genius engineers to pull the most out of her. I’d been looking for as much info as I could on CSS products, specifically the Super E and Gang E programmers when I ran across this gem. I didn’t even know it existed. I got to know it well, at least the hardware side. 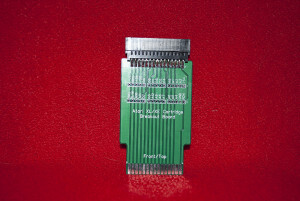 It may not be a polished as the Thompson Pro Burner or as well known as the CSS product, but this Atari 8bit computer based eprom burner rocks. Check out the product page for the Ralf David XL/XE Eprom Burner Bundle. I grew up listening to this man. I know it’s not hip anymore, and it was a different era then, but there are days now I turn off the tv and radio and fire up my old record changer and crank the volume up. Ole Possum, Buck and his buckaroos, Whispering Bill, the Man in Black and the rest of them are alive again and in their prime. So few are left alive now. Fewer now. Something undefinable is being lost and there is nothing we can do to stop it. But at least we still have the music and the memories for awhile yet. New Atari 8bit development pcb tool is available. Some might find a use. Others may think it is useless. I’ll be adding additional development pcbs in the near future so stay tuned. Post four in the continuing saga of the new 3d Printer. So far I’ve fixed a misaligned Y axis, discovered how to level the print bed, how to use the slicing software that came with the printer to get the gcode to the printer and printed a few objects of increasing complexity and print time to see how well the printer functions on long prints. I’ve noted a few strange noises that I am concerned about, but at this time do not seem to affect the print quality. With the last two prints I also began testing the detail capability of the printer. So far I have been somewhat impressed with the printer. My previous printer, when it was working right, produced very good prints. This printer at about half the price is giving it a run for its money, and I’ve just been using the stock settings and filament. 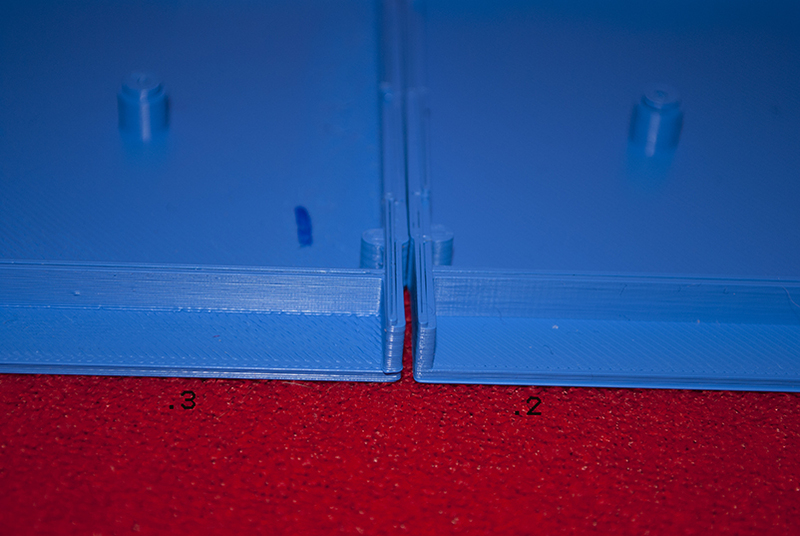 There are hints that using a more refined slicer program such as Simplyfy3D, playing with the layer height and/or changing the filament manufacturer could drastically improve the print quality even more. I intend to explore all three options in time. Durability of the printer is another concern, but can only be answered in time as I continue to print. One of the first major problems any maker has when they first start out is getting the print to stick to the bed while printing and only come off when the printing is done. Sometimes it is not as easy as it seems. There are several reasons for print lifting. Bed has to be level period. My first printer was notorious for psyching me out. Ten minutes into an hour long print, usually after I had convinced myself that I could pop out of the room to do a quick job somewhere else in the house, the print would lift from the print bed. It would then begin a tangled dance just above the print bed, growing with every extrusion of plastic. I’d come back in and discover a plastic art master piece that would win acceptance in the most famous art museum of the world if they had a category for it. I had a steadily growing pile of failed prints. The next major problem any maker has is the quality of print. Sometimes it’s a search that never ends. Just about the time you think you have the right formula dialed in, the slicer software upgrades and something minor in how it slices changes, now your prints are a mess again. Sometimes the filament manufacturer changes their formula and now you have to recalibrate your settings to get back the previous quality. Sometimes you never do and you have to start experimenting with other filament manufacturers product. Then you have the rest of the variables of temperature, different colors filament sensitivity, earthquake induced changes in bed leveling, (I’m serious….. Oklahoma is surpassing California in earthquake frequency) etc. So this is where we are right now. Dialing in the right formula to produce the best quality print. When we last were here I had printed one half of the KM-20 cartridge shell with the stock settings and filament to see what quality came out. I was pleasently surprised. But of course it can be better. I tried mating the printed half shell with the injection molded copy. It wouldn’t. So I mused that maybe it would mate with another printed half shell. It still wouldn’t. So why? There seems to be four most likely reasons. First always is the model. If it ain’t there, your prints won’t be there. Could there be a problem in the model itself? Since I didn’t create the model, I don’t have source files just the end product of whatever cad program they used. I did load the .stl file into MeshLab and noticed no obvious problems. So for right now on this print I have to put this reason in the neutral catagory. Third is the filament used. It’s amazing how much variety there is in a supposedly standard diameter of 1.75 amoung different filament manufactures. 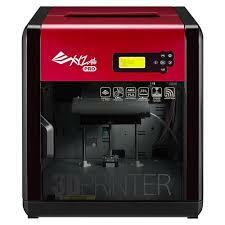 Currently I am using the filament that came with the printer from XYZprinting. I do have two rolls of Hatchbox, a black and a white. I also have a grey roll from Jet. I used Hatchbox with my other printer, but Jet is an unknown. Changing filament is a process that can take half an hour to do. It’s not just unload the old and load the new. There’s several additional software steps and info entry. And on this printer they did not supply a spool holder for 3rd party rolls. Besides in any testing you only want to change one thing at a time. So for now I will continue to use the supplied filament. This reason goes into the neutral category for now. So for the next printing session I will print both halves in the same printing session, at .2 layer height 20 % infill using the same software, filament and model. Here goes……..
First picture tells most of the story. Bringing the layer height down to .2 did make quite a bit of difference. 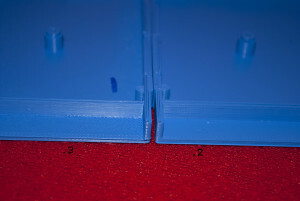 You can see less defined printer layers at the .2 compared to the .3. The edges became more accurate. There is still the split in parts of the lip and grove and in the horizontal bar at the bottom of the half shell. Not much changed there, which leads me to believe that it is an error in the original .igs file or the conversion to .stl. On the back of both half shells you can see the difference as well. In this case I think applying an acetone bath would smooth out most of the remaining printer layer striations. That would leave very smooth surfaces. To get a textured feel and look would require applying light grade of sand paper/rasp etc. Still the halfs do not mate. Though it does look closer than before. It would seem that 3d printing at least with the printer I have does not have the same tolorances that an injection molded part would have. A redesign of the model allowing for thicker lip and groove measurements would be the next step.